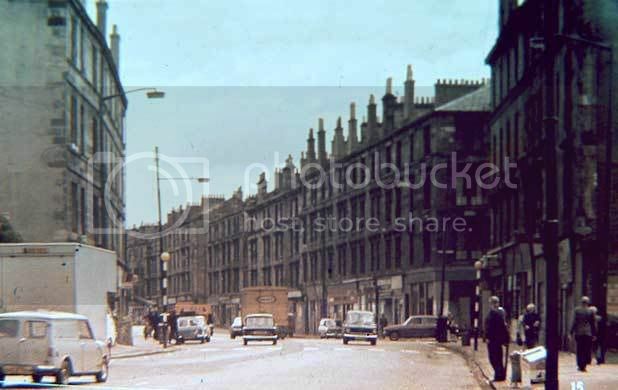 Maybe Argyle St at Finnieston/yorkhill sorta bit, looking towards city centre, Creme de la Creme building would be out of sight on the right hand side along the road a bit? Don't think so, most of that would've been demolished at the time of the photo. Alex, I don't suppose you could identify the pics taken immediately before and after that shot, as if they were taken on the same day we could narrow it down a wee bit. Sorry It's the nearest I could get without being Runover. Quite a few inconsistencies in the recent pic (Except the angle) the building on the front left has no Cornices above the windows, The Building at the corner of Bellgrove is angled but the chimneys match a bit but I still don't think it is Duke Street. Best thing is to get it Scanned A.s.a.p, Its a Glass slide so should be able to get a good digital copy of it. AlanM wrote: Alex, I don't suppose you could identify the pics taken immediately before and after that shot, as if they were taken on the same day we could narrow it down a wee bit. Sorry Alan, It's the only one I have all the rest are more recent and of a different area. Are you sure it's Glasgow? I wouldn't disregard a street on the basis that the chimneys don't match since during refurbs in the late 70's and early 80's the stacks were often reduced for safety reasons. I do however agree that it doesn't look like that bit of Duke Street, bits might be removed during refurbs but details are unlikely to be added. Shuggie wrote: Are you sure it's Glasgow? It was in amongst a bunch of Glasgow slides so I'm 95% positive it is but if you can match it out in Edinburger then go for it. It could be Duke Street but further along. Socceroo wrote: It could be Duke Street but further along. I don't think it's Duke St either. If you look at the windows of the first block of tenements in the recent picture, all the windows are 'singles'. But if you look at the block facing the camera in the old picture, on the corner on the right hand side, the windows are all 'doubles'. The more i look at it as well, the bend in the road seems more severe in the old picture. 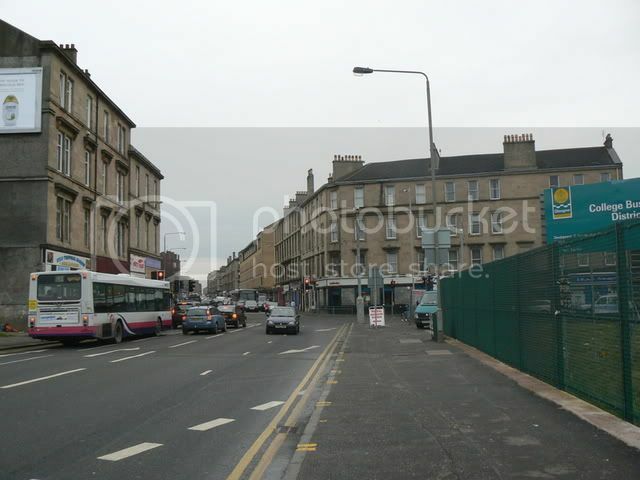 Not sure if it could be Maryhill Road either, i can't remember anywhere that has a bend like that in it - except (just remembering as I type this) the bit further down, almost at St George's Cross, just past the Jaguar car garage/Lidl's bit? Might there be a church just out the frame on our right? Looks like the tenements come to an end here and there may (to my eyes) be a signboard like the ones outside churches there. It's a Garvie's 'ginger' truck. AlanM wrote: I wouldn't disregard a street on the basis that the chimneys don't match since during refurbs in the late 70's and early 80's the stacks were often reduced for safety reasons. But the shape of the whole corner of the building is also all wrong -- short of a ground up rebuild that can't change. 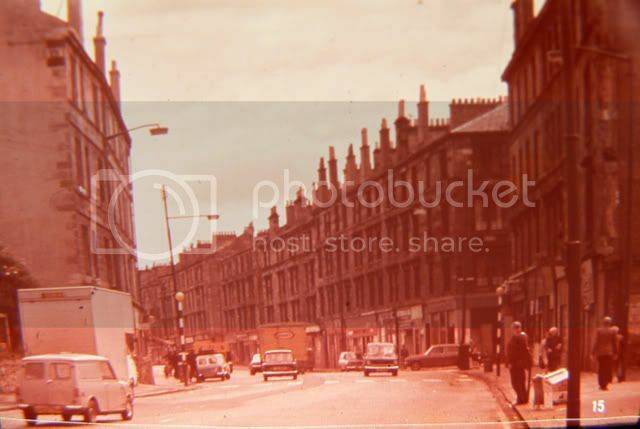 Had a thought that it was Hyndland Road with the top of Clarence Drive on the right. Most of it fits except the part of the building demolished in the extreme right of the picture is actually still there.